Egyptian artist Basim Magdy has had a productive exhibition history and has worked in text, drawing, and installation practices. More recently, his focus has turned to the moving image, and the result is a series of Super 8 and 16mm films (all available on his Vimeo channel) that have allowed him to expand from art exhibition contexts into film festivals. One of his recent films, The Dent (2014), currently on view at the New Museum Triennial, is a multi-layered collage of a fictional nowhere, mixing the documentary footage, field recordings, and written text that come out of his nomadic travels. Another, The Many Colors of the Sky Radiate Forgetfulness (2014) will show in April as part of Film Society Lincoln Center’s Art of the Real festival.We sat down to discuss his early decision, as a non-Western artist, to go beyond the national/regional framework, his recent film projects, and the surprises that have come out of sharing his films online. The Many Colors of the Sky Radiate Forgetfulness. Xin Zhou (Rail): You’ve been quite vocal about not being willing to be part of an exhibition under a national or regional narrative, as well as to associate your personal work with the immediate social and political realities of your local context, which means Egypt. I understand this manifesto was a result of your unwillingness to fulfill the expectations of the West. Perhaps we can start with this. 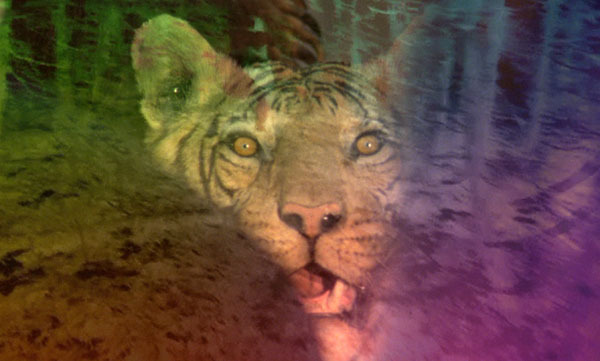 Basim Magdy: Well, it’s a result of both experience and the fact that my work is not particularly about where I come from. In my work I try to construct fictional places, settings, and scenarios that as many people from as many personal, cultural, and geographical backgrounds can relate to. I also find the idea of presenting a show about the art practices in a country or region to an audience in another country, an audience that knows very little if anything about the complexities of this place beyond information disseminated by the media, quite problematic. In principle, I’m not against showing my work in a show about Egyptian art now that would take place in Cairo, although I would probably still not participate because I believe any work of art should have more to it than where the artist comes from. I like my work to be presented in contexts that relate to what it is about and are more open than limiting. Another thing is when you put a lot of effort into making work that defies one particular interpretation, it would be hypocritical and wasteful to limit the understanding of the work to one dictated by preconceived ideas about where you come from. I really don’t feel my role is to introduce any audience to a place or its culture or art. Obviously I also don’t want to fall for the trap of stereotyping specific curatorial practices and I do respect what a lot of curators are doing and believe some of those shows are a great introduction between the artists and an audience they can’t reach otherwise. I just don’t believe it’s the right thing for my work. Rail: You picked up Super 8 film after you relocated to Switzerland? Magdy: Yes, that was mainly because I was introduced to it there for the first time. Rail: So it was new medium to you. Magdy: Yes, I know for some people who grew up with Super 8 cameras and projectors at home, my films look nostalgic, but for me it has absolutely nothing to do with nostalgia because I personally don’t have this affiliation with Super 8 film and it’s really not what the work is about. I came across my first Super 8 camera at a second hand store. I knew I could still get the film so I bought it and I made many mistakes before realizing this is a medium I could work with. What interests me in Super 8 is the quality of the image it produces. It’s also about film being a physical and tangible material that I can manipulate with my own hands, so for me it’s just a tool, a medium like anything else I use. It’s not about its history or what it represents to a group of people in specific parts of the world. It’s not about what was done with it in the past. It’s more about what I can do with it now. Rail: Let's move on to this piece, The Dent that you are exhibiting here at the New Museum Triennial. Magdy: I started working on The Dent a few years ago and it was the first time I had worked with 16mm film. Before that I had only worked with Super 8 and sometimes a bit of footage shot on my iPhone. I was doing a residency in a small coastal town in Canada and I started shooting things that I thought were interesting. I have this strategy where I shoot without knowing what I’m going to do with the footage, but with an understanding of what can be used in a film and what will be discarded. It’s not a calculated process, it’s more about intuition and learning from previous films I made. So I started shooting and then eventually I came across this dent on the façade of the deserted hockey arena where my temporary studio was. That’s the only non-fictional part of the narrative. It all started with a dent. Eventually the idea evolved into a layered narrative composed of a few small stories that run alongside one another. Sometimes they move closer, sometimes they intersect and sometimes they drift apart. I guess you can say the narrative has a conclusion, but it’s still very open and ambiguous. The main story is about a group of people—the inhabitants of an unidentified small town—and their aspirations and dreams, which they attempt to work collectively to realize. It’s also about their collective failures and their eventual acceptance of failure as the most present reality of their collective aspirations. Realizing nothing will ever be won, they decide to reenact their past and make the same mistakes their fathers and grandfathers made. Then there’s the story of the circus elephant, which is central to the narrative and somehow, very related to the first story. It’s about this giant creature that wakes up to find out it had become something else. Its reflection in a water puddle shows zebra patterns covering its whole body. The elephant takes out its frustration on the façade. So the fact that you can see the dent in the film is really the only evidence for all those events. It’s the outcome of all this, and it’s something that’s small, but again, I wanted to make something that’s ambiguous, something that responds to the way I see absurdity as one of the main component of reality. Unexpected things happen all the time. Sometimes our understanding of the world is shaped by seemingly unrelated details, but we choose to construct our narratives and memories from the details that make sense. We prefer to live in a logical reality, a reality that we feel comfortable with. Rail: In terms of the specifics of the image-sound-text relationship, can you talk about the process of the layering? Magdy: I come from a painting background. Although I rarely paint nowadays, I still make what I call “works on paper” because they stand somewhere between painting, drawing, and collage. I construct my frames when filming based on the same principles of constructing a painting. I balance the composition the same way. I guess my interest in layering also responds to the way I layer my works on paper with spray paint, collaged elements, gouache, acrylics, and watercolors. Working with film is a lot more complex because it involves moving images, sound and a narrative of some sort, which makes it a lot more exciting and offers more potential for communication. I see my films as compositions, constructed from layers and elements that mostly respond to one another in a suggestive way. Like gestures and hints, they rarely explain one another. They make references to reality but don’t try to replicate it. I try to imagine different versions of reality in my films, versions that look familiar but are unrecognizable. The point is to engage the viewers by leaving gaps for their imagination, their personal experiences and accumulated knowledge to help them understand the film. I’m not trying to make abstract films. They have to start from a point of familiarity; a city, a place, a tulip or an emotion. You have to feel something while watching a film, whether you consider it art or experimental or mainstream. Feelings are as important as ideas. Rail: Turning to your most recent film project, The Many Colors of the Sky Radiate Forgetfulness (2014). For that piece, you’re shifting the focus to nonhuman subjects, animals, and architecture in a post-historical sense. Magdy: The film started with an invitation by the cultural office of the city of Karlsruhe in Germany to create an artwork that responds to the city’s centennial commemoration of World War I. I accepted without really knowing what I would do. I knew nothing about Karlsruhe’s World War I history but I wasn’t interested in making a documentary or a historical film about facts. I went there a few times and filmed the few remaining monuments that were built right after the war. Very little of what happened during the war was documented in books. Most stories stood somewhere between documented history and fiction. At some point I found myself standing in a cemetery, surrounded by the tombstones of 52 kids who were killed in one particular attack. It was such an emotional moment that it didn’t feel right to do anything other than about this particular moment and what it meant. I didn’t want the film to be about history or even the people who died because it felt wrong to make professional gains from death. Even constructing fiction about this harsh reality of the death of 52 children seemed like an insult. I thought a lot about the ethical side of the film I was expected to make. In the end, I decided to make a film about what I didn’t experience but what I felt at that moment in the cemetery and what I imagined everything around me experienced. I was surrounded by silent witnesses of the sorrow that followed; the sky, the fleeting clouds, the trees, the bronze monuments and the tombstones. They were all there and witnessed this just like they witnessed everything else that followed. Back in my studio, I started cutting out pieces of paper and writing a sentence on each of them. Eventually, those sentences ended up becoming the script. I matched each piece of paper with a scene. It was a very manual process, like a collage of images and text that don’t necessarily translate one another but are subtly linked to produce an emotional experience. In the end the film became about collective memory and its inevitable surrender to the weight of time and layering of experience. The absurdity of that moment in the cemetery made it fitting to start the film with the starting dialogue from a short play I wrote when I was 21 about the devil vomiting scenic waterfalls. It seemed like the perfect introduction to the absurdity of reality that was to follow. Rail: A random question about exhibiting between the film context and the exhibition/gallery context. You’re showing film and video in film festivals, but also biennials/triennials. I suppose it's kind of a typical question for an artist like you who works in different circles in between different contexts. Magdy: Well, I have a not-so-typical answer for that. The whole film festival thing is completely new to me, so I’m trying to figure out how to deal with this new experience. I come from an art background where I’ve been showing at museums and art spaces for the last 15 years. I’m happy that my work is presented in both contexts, because for some reason they have different audiences. But there is also a very critical point here, which is in both cases the visibility of the work ends up becoming limited by the place and time where they are being exhibited or screened, and sometimes even the price of a ticket. This has always been problematic for me because it makes watching my films an exclusive experience. If I’m showing the film at the International Film Festival Rotterdam and you’re in Rotterdam, you’ll see it. But in Paris or Cairo or Mumbai you’re not going to see it because the film is not screened of exhibited there. Rail: So you put them online? Magdy: Exactly, that’s why I do that, and that’s my way of negotiating this situation. It’s very important for me that the films are online which makes them available in a different format. This allows the films to reach a completely unexpected audience, which is a lot of interested teenagers from all over the world. It started with someone who made a screenshot from one of my earlier films, 13 Essential Rules for Understanding the World (2011), and put it on their blog, and their blog was quite popular, so it got over 40,000 likes and reblogs in a couple of weeks. This was really amazing for me. This is actually one of the highlights of my career, because it’s an audience that I couldn’t have reached otherwise and of course the numbers are unimaginable for me. But it’s also very important to me that I can reach an age group that’s younger than I am. It’s nice to feel that you can communicate with different groups of people. At the same time watching a film on a giant screen at a movie theater or on loop in a museum or art space is an incomparable and magical experience and I feel very fortunate that my work can be seen in those three contexts at the same time.